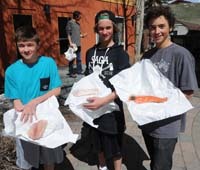 Community School eighth-graders have concluded that fish, although typically tainted with mercury, are generally safe to eat as long as one doesn't overdo it. An exception might be swordfish. According to a study conducted by the students, two samples of swordfish purchased locally tested higher in mercury than the federal Food and Drug Administration standard of 1.0 part per million. The findings are the result of a study conducted by teacher Scott Runkel and 16 of his eighth-graders. The students studied mercury levels in fish caught locally or purchased at local grocery stores, and then compared the results with government standards. The students and Runkel presented their study to the Idaho Mountain Express on Friday. Runkel, an avid fisherman, explained that the student study built on several years' worth of data that he has collected personally on mercury levels in locally caught fish. He said he became interested in the subject five years ago when news media reports discussed the possibility of elevated mercury levels in fish caught in Silver Creek. Though the Idaho Department of Health and Welfare later determined that Silver Creek fish were safe to eat, Runkel said he remains concerned because the state does not have a uniform testing program to determine mercury levels, even though it will issue a fish consumption advisory if mercury levels are found to exceed .3 parts per million. Runkel's own studies of fish caught locally mainly showed mercury levels in the .1 to .2 parts per million range. The students took Runkel's data and compared it with mercury levels in fish sold locally. Testing was done by Micro Analytical Systems, a leading laboratory for determining mercury concentrations. Runkel said the class got a good deal from the company, which agreed to test samples for $12 each. But before testing could be done, the students needed to decide what type of fish they should test. A community survey was conducted to determine the type of fish that people typically eat in Blaine County. Ultimately, the students settled on 10 types of fish: swordfish, halibut, tilapia, cod, trout, ahi tuna, canned tuna and three types of salmon. Of the 10 species tested, the overall average mercury level was .11 parts per million, well below the FDA standard of 1.0 part per million and the state of Idaho fish consumption advisory of .3 parts per million. However, two different samples of swordfish tested above the FDA standard. One came in at 1.51 parts per million and the other at 1.38 parts per million. The students explained in their presentation that large predatory fish, such as swordfish, tend to accumulate higher mercury levels because they eat smaller fish and add the additional mercury levels to their own mercury burden. Ahi tuna, commonly served as steaks, tested second highest, with samples showing mercury levels of just over .5 parts per million. According to the study, hatchery-raised trout sold locally showed no mercury contamination. Results on salmon sold locally ranged from negligible to .01 parts per million. The study, an example of project-based learning, included more than just sampling mercury levels in fish. The students also studied the health effects of mercury accumulation, explaining that high levels can lead to birth defects, loss of memory, neurological disorders and heart disease. The students explained that eating a fish with a high level of mercury isn't going to cause instant death. Instead, mercury levels build up in human bodies just as they do in fish, and consumers need to be aware of how much mercury they are accumulating. They also studied how mercury gets into fish, explaining that it accumulates in water, to be absorbed by fish, because of atmospheric fallout from volcanoes and mining operations. The students further studied federal and state regulations. Their basic conclusion was that most fish caught or bought locally are safe to eat, but they suggested that it is likely best not to eat fish every day. "I'm not really a huge fan of fish, but one of the fish I used to eat a lot was swordfish," said student Lexi Black. "I'm really more careful about what I eat now. You can still eat swordfish, but in moderation." "I really didn't know anything about mercury, but I learned how it gets in our fish and into our bodies and how it's dangerous," said student Colby Wright. In addition to learning about fish and mercury, student Bella Stethem said the study required a lot of math and science. "It was a cool way to learn about all those subjects," she said.